FORT BELVOIR, Va. (Oct. 6, 2015) – Hot Topics is back, providing a monthly breakdown of current news, important dates and updates affecting the Army Acquisition Workforce (AAW). 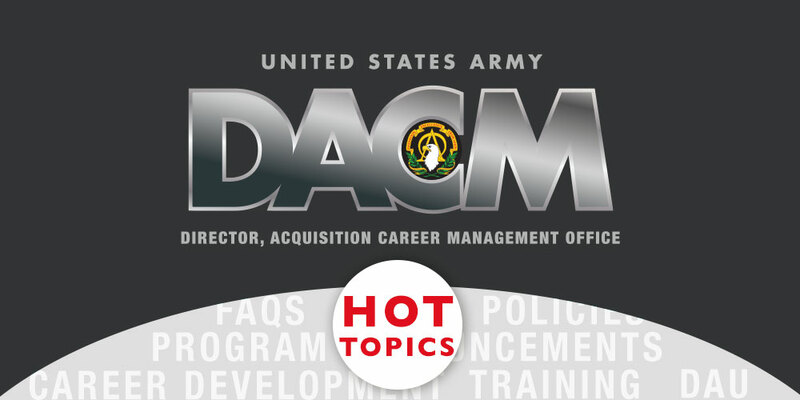 Developed by the Office of the Director for Acquisition Career Management (DACM), Hot Topics 2.0 is designed to provide the AAW an overview of what’s new related to acquisition careers, current training opportunities and changes, as well as a look at new opportunities on the horizon. A new edition of Hot Topics will post the first week of each month to provide information on current issues affecting the workforce and break down the training and development opportunities that are opening and closing in the next 30 to 60 days. Are you or someone you know new to the AAW? Recently, the Army DACM Office launched an onboarding webpage designed to provide a starting point for new Army acquisition professionals. The Senior Rater Potential Evaluation policy took effect October 1 and affects the entire AAW, starting with those at the GS-14 level. Read the policy, FAQs and other materials to learn more about the annual mandate that is now in place. Questions? Please submit them through the Workforce Management Inquiry system to receive a response within 24 hours. The FY16 Army Acquisition Civilian Student Loan Repayment Program application window closes October 29. Eligible AAW professionals include those who are permanent or term (with at least three years left in a term position) and are certified or within the certification grace period for their career field. Manager and Acquisition Director Board application window for lieutenant colonels and GS-14 AAW professionals closes October 30. Colonels and GS-15 professionals have until November 14. The Training with Industry application window closes November 3. This opportunity is open to majors and lieutenant colonels. A separate announcement will open later this year for senior NCOs. FY16 Product Director Centralized Selection Board opens October 26. The Acquisition Leader Challenge Program nomination window opens November 3, for second quarter classes. Learn more about the program and how to be nominated. DAU has issued updated certification requirements for program management, facilities engineering and science and technology. Visit the iCatalog for further details. The Army DACM Office — for everything acquisition career related.